Kate Moran, who plans a career in international development, will be the first student to graduate with a major in Arabic Studies, a new degree option focused on Arabic language and culture. Long before she spent summers working with orphans in Morocco or studying Arabic language and culture in Jordan, Kate Moran was captivated by the Middle East. That may seem a curious connection for a young woman raised in St. Michaels, Maryland — a hometown she describes as an "incredibly homogenous" seaside resort community of about 900 residents located on the Eastern Shore of the Chesapeake Bay. "People always wonder how I became interested in the Middle East," says Moran, a senior in Emory College of Arts and Sciences. "It's just something I was obsessed with." "Before I got to college, I knew what I wanted to do," she says. "Middle Eastern studies always held a fascination for me. So I decided to try some classes and ended up falling in love with the subject." Her dedication will pay off May 11, as Moran becomes the first Emory College student to graduate with a degree in Arabic Studies — a new degree option introduced just last fall through Emory's Department of Middle Eastern and South Asian Studies (MESAS), which promotes humanities-based, cross-disciplinary scholarship. With some 300 million Arabic language speakers from Iraq to Morocco — and pockets outside of the Middle East and North Africa, including communities in sub-Saharan Africa and Asia — the Arab world has long played a significant role on the global stage, says Rkia Cornell, professor of pedagogy and Arabic Program Coordinator. The new major was designed for students from a wide variety of disciplines and backgrounds interested in applying knowledge of Arabic language and culture to an ever-expanding range of fields, including opportunities in areas such as business and non-governmental organizations (NGOs), law, religion, education, security studies, and public health, Cornell says. Though still in its first year, Cornell reports that four Emory students have already declared Arabic Studies as their major. "The future looks good," she says. As one of the few departments in the U.S. that offers an undergraduate degree in MESAS — and now, Arabic Studies — Emory's program is defying national trends, Cornell says. After nearly 20 years of growth, overall enrollment in languages other than English at American colleges and universities fell nearly 7 percent between 2009 and 2013, according to a report released this spring by the Modern Language Association (MLA), which surveyed more than 2,400 institutions of higher education. Cornell credits that rise to the growth of post-graduate employment options, as well as a welling desire in students to contribute to peace-building and global humanitarian enterprises. "Some of our students really want to do something about problems in the world," she says. "They are young people — dreamers, not scared and looking for challenging subjects." In addition to language studies, the major allows students to take classes in areas such as Arabic literature and culture, gender studies, and Islamic civilizations studies. MESAS also encourages participation in study abroad programs. "With Arabic studies, it's not just the language by itself — there is also a whole culture that comes with it, including geography, history, literature and anthropology," Cornell says. Although Arabic is frequently seen as one of the more difficult languages to learn, Cornell says students find the program both rigorous and well supported. "With Spanish or French, there is a familiar element of European culture," she says. "Arabic is a very different script, so everything about it is an enigma. It's not like when you study French and you recognize certain kinds of words." "It is a difficult language," she adds, "but we do a lot of work behind the scenes to make it educationally friendly." As a freshman, Peter Habib recalls seeing Arabic 101 in Emory's course atlas and thinking it would be a fun language to fulfill graduation requirements. "I really enjoyed it," says Habib, a senior who will graduate this month with honors as a MESAS major and a development studies minor. "I just fell in love with the language, and the faculty is incredibly supportive and encouraging." "In my mind, it's one of those critical languages that is important to students, especially for peace and conflict resolution," adds Habib, who is one of three MESAS scholars awarded 2015-2016 Robert T. Jones Jr. Scholarships to St. Andrews University, where he will pursue a Master of Letters in Middle Eastern, Caucasus, and Central Asian Security Studies and continue his Arabic studies. For Moran, that was an important reason to major in Arabic Studies. 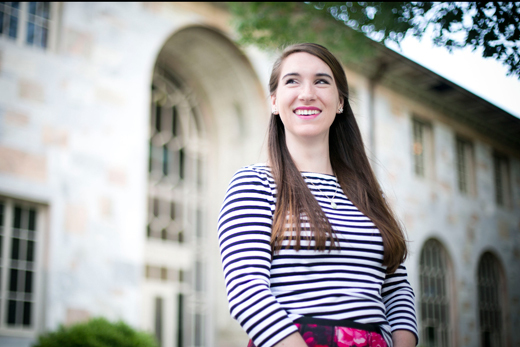 While some of her peers have embraced Arabic Studies with an eye toward national security and defense, Moran says study abroad opportunities in the Middle East she experienced while at Emory have given her other ideas. "We don't always think of it (Arabic) as a language for understanding and cultural appreciation, but the opportunity is there — I know I want to spend my working life speaking Arabic," says Moran, a MESAS honors student who will graduate with a double major in MESAS and Arabic Studies. This summer Moran plans to return to Morocco to engage in intensive language and cultural studies through the Critical Language Scholarship (CLS) Program, a fully funded overseas language and cultural immersion program for American undergraduate and graduate students offered through the U.S. State Department. "Ideally, I'd like to get a joint PhD in anthropology and Middle Eastern studies and eventually pursue a career in international development, using my degree to help make the field more community-inclusive, specifically focusing on initiatives in the Arabic-speaking Middle East," she says.